But Ahhhhh! look at that view! I had forgotten that there is such a thing as a dress code. You entered the rarefied airs where life and cinema-pretend life collide. It's always beautiful there. Sounds delightful and I love the view! Oh dear, I haven't had crisp jeans since... well, I'm not sure when I had crisp jeans. Probably the first time or two they were worn and then... But it looks like a lovely spot and a break in the action! And who doesn't love a trip away? Oh, I want to hear more!! That sounds so absolutely exciting!!! An old fashioned resort! Hey, your writing reminded me a little bit of Grand Hotel Budapest -- have you watched that? I LOOOOOVED it! P.S. I wanna know where this resort is! I hope you stayed more than one night! 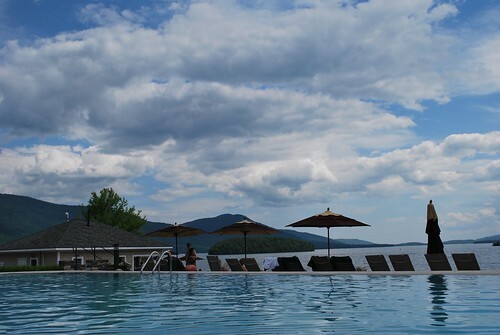 L: It's the Sagamore Resort on Lake George in the Adirondack Mountains. We stayed two nights -- wish it could have been longer! I haven't seen Grand Hotel Budapest -- I'll have to watch it. I live on the Western part of India at about 1900' above MSL on the Wetern Mountain Ranges. For me getting to the mountains is about twenty minutes driving time and I do it often. It is now monsoon here and a particularly scintillating time to visit the mountains. My reaction to any notification about dress code would be "Let me see who will stop me!" Before you get carried away, mostly the dress codes are part of old stuffy colonial time clubs to which I don't go but when I do, I would insist on wearing our national dress and dare them to stop me. My idea of fighting against colonialism! You can imagine therefore that members of such clubs avoid me like the plague. I like your blog and have subscribed to receive notification of your posts by feedburner. HA! I should have known, I think this is the resort that my friend showed me years ago and that she DREAMS of going to! WOW. Is there another one like that in upstate NY? But from the photos it looks like this is the one. I wish I could afford to pay for my friend & her husband to go! I hope she'll go for her anniversary someday. WOW, what a hotel! OK, actually it may be another one. 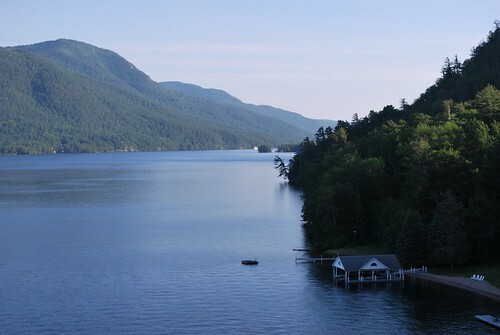 I remember there being this steep cliff in the back of the hotel, towards the lake. NY state is full of fancy places, it seems! It's the Mohonk Mountain hotel. The website talks about "grand hotel tradition" -- you have to watch The Grand Hotel Budapest! It's a crazy kind of film, but visually stunning, funny and grandiose at the same time.